It must be one of Murphy's Law's: "You'll always find the perfect reference after you don't need it any more". So it is that this great example of Ernest Chiriaka's work for Hollywood magically appeared before my eyes after our week of examining the artist's work. 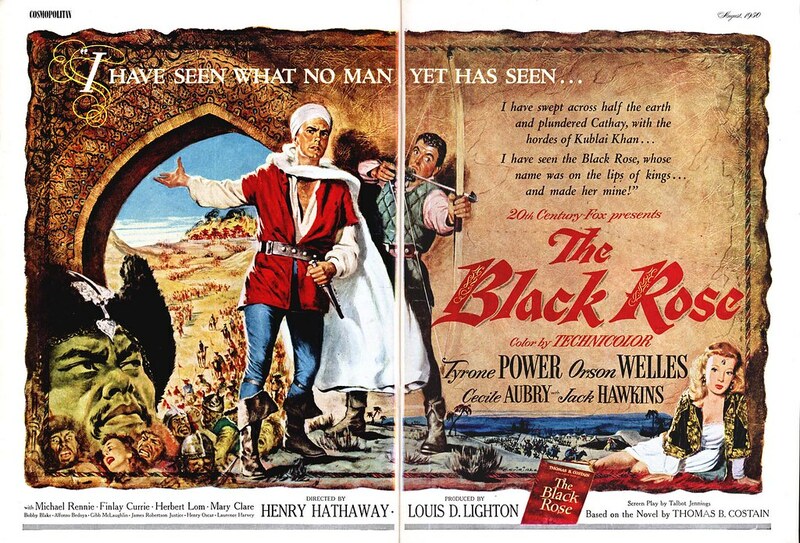 Chiriacka’s agent showed his work to 20th Century Fox studio chief Spyros Skouras, who hired the artist to paint the movie poster for the first major CinemaScope film, The Robe. Not knowing how to approach this kind of assignment, Chiriacka made a color sketch to suggest a possible design concept, but instead of being commissioned to paint a full-sized finished version, Skouras said, “That’s great! I’ll buy it! I’ll take it just like that. Wrap it up!” And Chiriacka’s preliminary sketch became the final poster for this historic widescreen spectacle starring Jean Simmons and Richard Burton. This blockbuster film saved 20th Century Fox and won four Oscar nominations, and set the 1950s trend in Hollywood for swords and sandals. The innovative technology of CinemaScope was copied by all the major studios, and it temporarily enticed the American masses to turn off their television sets and go out to see the movies. *You can see this image at full size in my Ernest Chiriaka Flickr set.